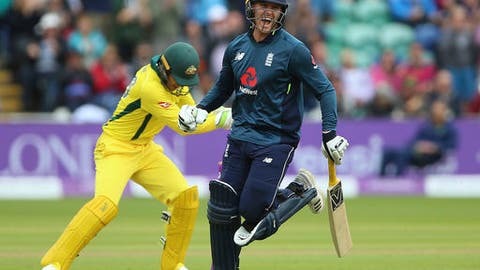 CARDIFF, Wales (AP) Jason Roy’s century trumped Shaun Marsh’s as England beat Australia by 38 runs in the second one-day international to lead the five-match series 2-0 on Saturday. Opening batsman Roy was unruffled by two rain breaks in scoring 120 off 108 balls, and stand-in captain Jos Buttler hit an unbeaten 91 to lift England’s total to 342-8, its highest ODI score against Australia. Marsh kept the visitors in the hunt with a gritty 131 – his first ODI century since 2013 – until he was eighth man out in the 46th over. Liam Plunkett (4-53), who bowled Marsh, and Adil Rashid (3-70) saw off Australia for 304 with 17 balls to spare. Australia’s top order faltered again after losing the first ODI by three wickets at The Oval. Debutant D’Arcy Short fell for 21 and his opening partner Travis Head for 19, brilliantly snapped up by Alex Hales. Marcus Stoinis (9) and Aaron Finch (0) made no impression and just when Glenn Maxwell (31) looked to turn things on for Australia he holed out at mid on. Australia slipped to 164-5 in the 31st over. Ashton Agar (46) and Marsh provided Australia hope with a 96-run, sixth-wicket stand before Rashid returned and had left-handed Agar stumped off a googly in the 43rd over. Marsh, who survived two difficult chances at mid-wicket on 5 and 27, hit 10 fours and three sixes before Plunkett clean-bowled him off a slower delivery and ended Australian hopes. ”The way Shaun Marsh batted showed we could have chased, but until Ashton came out we didn’t get going,” Australia captain Tim Paine said. Buttler lost the toss as he led England after regular captain Eoin Morgan pulled out just before the toss due to back spasms. Roy featured in four of the innings’ five half-century partnerships after Jonny Bairstow (42) set the tone for a big total in a 63-run opening stand with Roy. Alex Hales (26), Joe Root (22), and Buttler also added at least 50 runs with Roy, who hit 12 fours and two sixes with some powerful drives and pull shots. Roy finally fell in the 36th over to a terrific catch by Paine behind the wickets down the leg side in seamer Kane Richardson’s (2-56) return spell. Buttler took charge and hit eight fours and two sixes in adding 50 runs with Sam Billings. Buttler gave the innings a great finish by hitting Andrew Tye (2-81) for two boundaries off the last two deliveries. The third ODI is on Tuesday at Nottingham.